Proteins are the action molecules of all cells, and to function properly, protein chains must fold and assemble correctly. But each chain of every protein runs the risk that it will combine with one or more identical chains to form nonfunctional aggregates. 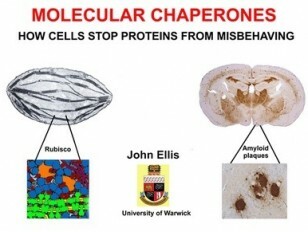 Some protein aggregates are toxic to cells, such as neurones, and thus contribute to neurodegenerative and other human diseases. The probability of aggregation is increased by the highly crowded state of most intracellular compartments, but is reduced by the activities of a diverse group of proteins acting as ‘molecular chaperones’. Professor Ellis will present a historical and personal account of some of the key concepts and basic evidence. Professor John Ellis studied botany and biochemistry at King`s College London. He moved in 1970 to the Department of Biological Sciences at the University of Warwick and retired as Emeritus Professor in 1996. John Ellis is the author of How Science Works: Evolution. The 2011 Croonian Lecture has been awarded to Professor John Ellis FRS for his pioneering contributions to biochemistry, molecular cell biology and also plant sciences.